The long awaited start of the Tucson Streetcar system is here! 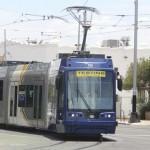 Today, July 25, 2014 is the day to catch a ride on a modern Tucson streetcar. Streetcars in Tucson actually go all the way back to 1904 when the City of Tucson had its first streetcars. The street cars were drawn by mules and horses. A mere two years later, the mules and horses were taken out of service and electric streetcars introduced. 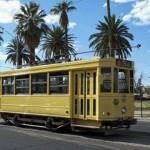 The electric streetcars operated from 1906 until December 31, 1930. In January 1931, the Tucson streetcars were replaced with buses. In 1993, the Tucson Heritage Trolly line began operation. The trolly system rehabilitated some old abandon track that have been paved-over track along University Avenue. That stretch was combined with new track along 8th Avenue and 4th Avenue. In 2006, a Regional Transportation plan was adopted the initiated the funding for a new modern Tucson streetcar system. Construction was begun in 2010. After 4 years and some $200 million for construction, the modern Tucson streetcar system is ready. Anyone that has walked past one of the new streetcar lately, might have noticed the ticket vending machines. Tickets are required to ride on the Tucson streetcars. No money can be used on the streetcar. Tickets will need to purchased before boarding a Tucson streetcar. Also, this new modern technology comes new rules for the cyclist, pedestrian, and motorist. The safety rules and things to review to be up-to-date are available on a short youtube video. North 4th Avenue, know for ist Tucson nightlife, is pulling out all of the stops in order to celebrate the streetcar operations. Fourth Avenue will be decked out with colorful banners and sidewalk sales. Businesses and residents in the Mercado district in the Menlo Park neighborhood see the Tucson streetcar system is a bridge. Making it easier for people to get from downtown Tucson to the Mercado district just west of Interstate 10. The Mercado San Agustín will be another spot for excitement on Friday. The charming courtyard of the Mercado is encircled by a variety of local eateries and shops are all ready to celebrate the Tucson streetcar launch. This is also the point where Tucson streetcars loop back toward downtown. For the University of Arizona campus Tucson streetcar celebration is designed to acquaint people with the many reasons why the UA is such an exciting academic hub. The overall Tucson development effort is adding brewpubs, the exciting downtown Tucson restaurants and trendy student-housing. And there’s more of everything coming to downtown Tucson and these projects are critical to future prosperity. AC Hotel by Marriott selected downtown Tucson for a brand new concept hotel. It will be an 8-story, 150-room hotel at 5th Ave. and Broadway. This brand is big in Europe and provides a very distinctive and modern style. The Rio Nuevo District and City have been working on this public-private partnership (P3) project for a prolonged time period. Financed by private money at a cost of $32 million, the P3 hotel got its final OK this month. Due to open in 2016, it will create 220 new jobs in the city. It is estimated that over 200 construction jobs will be created to build this new hotel. The hotel is adjacent to the first downtown grocery store in many years (11 S. 6th Ave.) and slated to open up in December. The Johnny Gibson’s Market, leased by previous and current owners of Rincon Market, is to share a common area with the new hotel. Additional Tucson downtown development is taking place at the former First Baptist Church Educational Building on 5th street. The structure will be redeveloped as the national headquarters for Mister Car Wash. The 25,216 square foot building had a sale price of $1.5 million in November. In mid-town, the historic El Con Mall was just sold for $81.75 million. The 785,000 square foot center and leased pads are on 93 acres. Located on E. Broadway, this center is the largest tax feeder for downtown development within the Rio Nuevo TIF District. A request for proposal private was sent to developers likely to undertake this eastern gateway to downtown project. The RFP requested developers to offer to suggest ideas on purchasing or leasing. The RFP is due by June 30. Anyone that is looking for space downtown should have “No problems”. At this time, there are 6 contiguous 10,000-SF options available. The total available downtown space is over 300,000 square feet. It sounds like alot, but is much less than there used to be. Considering a move to Tucson AZ or planning for a future place to retire? We can help.